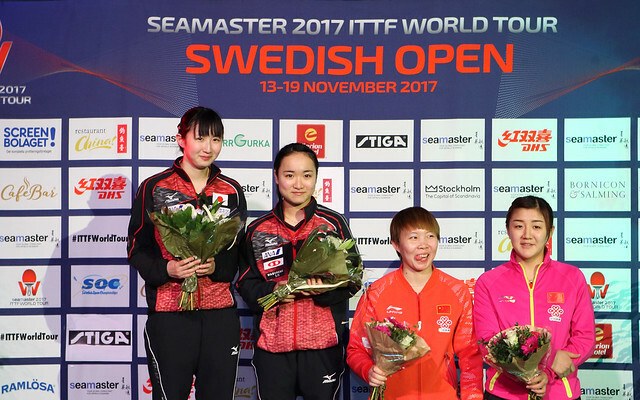 Eyes focused on the host nation’s Matilda Ekholm, as proceedings commenced in the lower half of the draw in the first round of the Women’s Singles event at the Seamaster 2017 ITTF World Tour Swedish Open in Stockholm on the early evening of Thursday 16th November. Furthermore, she did not disappoint the faithful in the Eriksdalshallen. She justified her position as one of the players who had not been required to compete in the three day qualification tournament; the no.15 seed, she beat Hong Kong’s Minnie Soo Wai Yam in five games (11-9, 11-9, 13-15, 11-7, 11-9). Throughout the contest, she remained calm and focused, her controlled top spin style of play rewarding her faithful supporters. Success for Matilda Ekholm, a result that rather overshadowed a most efficient and professional performance from China’s Chen Xingtong; required to compete in the three day qualification tournament, she accounted for Japan’s Miu Hirano, the no.5 seed, to record what was to prove the biggest upset in the opening round of the Women’s Singles event. Chen Xingtong prevailed in five games (6-11, 11-8, 11-4, 11-7, 11-8). Defeat for Japan contrary to expectations, it was the same for Hitomi Sato, the no.9 seed; she was beaten by Turkey’s Hu Melek, likewise in a five games contest (8-11, 11-9, 11-6, 11-8, 11-8). Results against the odds, not for China’s Chen Meng, the no.3 seed; she beat Lee Ho Ching, like Minnie Soo Wai Yam from Hong Kong. She emerged successful in six games against a very spirited adversary (11-2, 9-11, 11-6, 7-11, 11-6, 11-5).